We make various chutneys with the fruit, coconut yes a fruit and not a nut as correctly said by Suganya. Coconut is also called the King of Palms and this particular fruit and other types of nuts served as the original Fast Food for the early man. Now to this particular recipe, this is unlike the usual coconut chutney that we make. You can see them served in hotels served as a side dish for idlis, vadas and dosas. My grand mother makes it so well. She grinds this chutney in the traditional way in an Aatukkal (stone grinder) though she has a mixie. She insisted that the chutney tastes better when ground in the Aatukkal than when ground in the mixie. Now that I make the same thing in a mixie I could perfectly understand her reasoning. There is really a tremendous difference. But we have got to do our best with what we have at hand; as time is the essence and we can’t afford to waste it. In a mixie jar put all the ingredients and grind them to a fine smooth paste by adding water little by little. 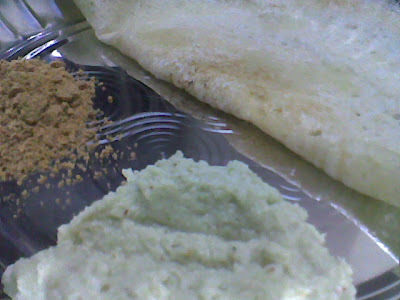 The ground chutney should be thick and not watery like the usual coconut chutney. There is no need to temper this chutney. Serve it with hot idlis, dosas and vadas. When you place the chutney on the plate it should stay put as shown in the picture and not run around as the usual coconut chutney does. The important thing is that the spiciness of the green chilli should be less in this chutney and the sweetness of the coconut should be more predominant. Tip: Instead of serving this chutney as a lone side dish, serve another side dish along too like Idli Milagai Podi or Sambar. It will taste even better. This goes to Suganya’s AFAM: coconut. If you feel my blog is informative then comment there and keep in touch….